Back in May I took a look at AIM Triton in its early stages of development. Since then, quite a bit of work has been put into the IM client that will soon replace the current generation (version 5.x) of AOL Instant Messenger. I haven't really had a chance to test the actual IM functionality, simply because my friend Mike and my brother Mike are the only ones I ever chat with on there, and they're both offline (no, being named "Mike" isn't a requirement for getting on my buddy list), but the feature set has definitely increased at least tenfold since I last took a look, and the UI is as streamlined as ever. However, AIM Triton is not the reason I am posting here tonight. I am posting because of one of the interesting side-effects of installing the latest beta of Triton – AOL Explorer. Right now, it looks like AOL Explorer is still in beta too, but it looks just as streamlined and feature-packed as the program it was packaged with. First off, I just have to say I'm disappointed they've gone with Trident, IE's rendering engine, as their default engine, especially since AOL had such a relationship with the Mozilla Foundation at one point in time. However, I suppose that is neither here nor there. In case your wondering, it's easy to tell Trident is doing the rendering work because my blog renders exactly as it does in IE (read: not quite as I designed it to). 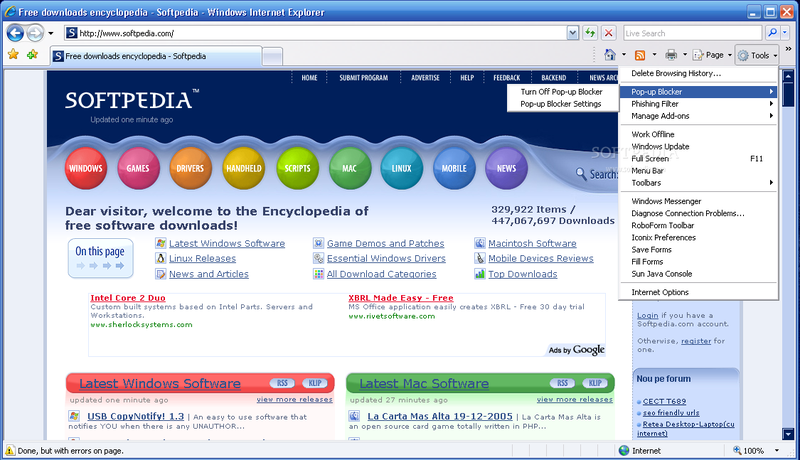 As you can see, tabs are positioned above the navigation bar (like in Opera), the navigation bar itself is bare-bones (much like that of Internet Explorer 7), it indicates available feeds in the address field (like Safari and Opera do), and it contains content tabs down the left-hand side (much like several recent versions of Netscape have). There are also divided sections in the lower right-hand corner of the browser's chrome (not visible in the screenshot) that look eerily similar to those in Firefox. My initial impression, if I throw out the fact that Trident is involved here, is that AOL Explorer is actually a pretty decent browser. Granted, it can't quite hang in the ring with Firefox and Opera (and probably not Safari, but I'm not a Mac user so I won't go there) but it can definitely hold its own against (if not pummel) the likes of Internet Explorer and Netscape. The "Desktop Search" and "Power Browsing" options in the main menu open up a whole slew of other questions, but that will have to wait until another day. The only real knock I can make against AOL Explorer (again, if I ignore the whole Trident issue) is that upon running it I am immediately presented with a dialog titled "Welcome to Spyware Quick Scan" that offers to scan my computer for spyware and virii. And in true AOL fashion, the only button available to me is "Continue." No "Cancel?" Come on. Luckily I spotted the red "X" in the upper corner, but who knows if I'm going to see that same dialog again next time I fire up the browser (if there is a next time). If you're at all interested in new browser technology, I recommend installing AIM Triton and checking out AOL Explorer when you have some time. You may not make the switch, but then again, maybe you will.